One of the most difficult decisions that you may make when it comes to your next kitchen remodel is what color you should go with. There are so many different designs, color combinations and styles that you can choose from that it can sometimes become difficult deciding which color is right for you. Here are five reasons why choosing to go with white in your next kitchen remodel might be a good idea. Reason #1. Contrast. One great reason to go with white is that it provides for a great contrast to the colors and materials that you might bring into your kitchen. From marble countertops, stainless steel appliances and other cabinetry and lighting, the white will help emphasize surfaces. Reason #2. Create an Illusion. Lighter colors can automatically create the illusion of a larger room, so if you have a smaller kitchen space or want to create the illusion of a larger room, going white is a perfect way to accomplish this. Reason #3. Easy to Mix-and-Match. White goes with anything! So, when you get bored with your color scheme, you can easily change it up with a white kitchen by bringing in other colors. Reason #4. Clean & Sleek. 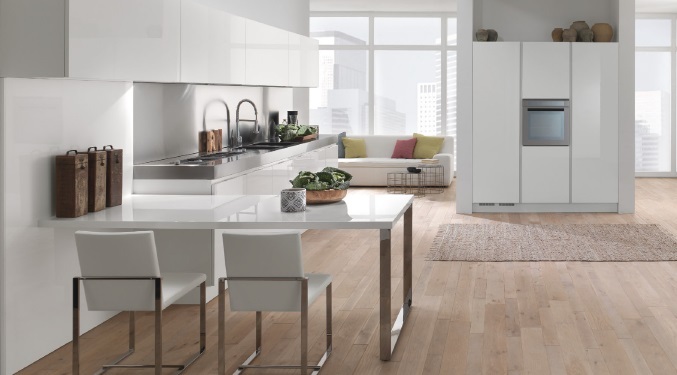 White is clean and can give your next contemporary kitchen remodel a very sanitary and sleek appearance, which can make your guests feel safe and right at home in your kitchen. Reason #5. Re-sale Value. You may decide down the road to sell your home and if you ask just about any realtor, having a white kitchen will help you sell the home because of all of the reasons above and the clean canvas that it gives a prospective buyer when viewing your home. Whether you’re thinking about going with a more modern look, or even a traditional feel, white seems to be color choice that you can’t lose! It’s a win-win for everyone and it will bring a bright, beautiful feel to your home that will make you want to come home, cook at home and even entertain guests—over and over again! Not all homes have a large kitchen and if you’ve ever had a small kitchen space, you probably have found yourself feeling frustrated and limited. Whether you’re looking to do an entire remodel to your new kitchen or simply find some ways to upgrade your kitchen space to look bigger, here are some tips for maximizing your small kitchen space to get the most out of the space you have! Tip #1. Go White. Lighter colors will always make a room feel larger than it is, so white may be the way to go. If not white, then at least go light. Look for lighter colors and you can tie in other kinds of colors into your kitchen with a variety of accessories and artwork. Tip #2. Smart Storage. Whenever you’re working with small spaces, you need to be smart and creative about using as much space as possible. There are many ways that you can maximize the cabinet, drawer and even overhead storage space to take make sure you using as much space as possible. Be creative and remember that any open space in drawers or above your head may be an opportunity to get more out of the space you already have. Tip #3. Lights, Lights, Lights…Did We Say Lights? Not only does white (or light) colors help make a space appear larger, but adding in lighting will as well. Try to use as much natural light available in your home to light up your kitchen. From larger windows that can bring in natural light, skylights and other lighting ideas in your kitchen, the brighter your space is (from lights and the colors you choose), the larger the space will feel. Tip #4. Mirror, Mirror, On the Wall. Mirrors are a great way to make smaller spaces appear larger, because they reflect the image of the room giving the illusion of much larger space or even a second part of the room. Try being creative with the use of mirrors and/or reflective materials to help give off the reflection of more kitchen space. Tip #5. Dual Purpose. Find ways in your kitchen to utilize space for multiple purposes. For example, if you’ve always wanted an island but can’t seem to figure out how that’ll work out and still allow you enough room for dining space, perhaps you’ll build an island that also serves as an eating area with bar stools or chairs. Islands can also serve as additional storage space, ovens, stove tops, sinks and other functions. Find out what’s right for you and what needs you have and make that island work for you—multiple times! Your space limitations don’t have to limit all that you can do in order to have your dream kitchen. There are so many design options and remodeling techniques available to make even the smallest workspace workable for you and your family. Contact the kitchen remodeling and design experts at EuroAmerica Design today for more information! One of the key components that make up modern and contemporary kitchen designs is that it typically involves an organized, clutter-free kitchen space. Maintaining an organized kitchen not only allows for better functionality while preparing food and hosting guests, but it gives you an incentive and desire to want to show off your kitchen space and have people over to entertain. Thanks to the folks at EuroAmerica Design, here are some tips for keeping your modern kitchen organized. Modern Kitchen Organization Tip #1: Maximize Your Cabinet Space. Your cabinet space is your friend and the more that you can maximize your cabinet space, the better. This means in your design phase, using all of the vertical space in your kitchen for installing cabinets to hold all of the plates, bowls, cups, serving dishes, cookware, etc. The more you can tuck away neatly into a cabinet, the more you will keep the clutter out of view from inside your kitchen. This doesn’t mean to just throw everything in a cabinet. Be strategic about where you place dinnerware, cookware and cups. Modern Kitchen Organization Tip #2: Purge the Pantry. As you do an inventory of your pantry to determine what to may need to buy, use that as an opportunity to purge the pantry. Inventory which foods have an expiration date coming up, determine which foods might be good to donate and find an organization system to your pantry that makes it easier to locate items. For example, you might keep all of the pastas together, along with all of the pasta sauces and spices together. You might keep soups together. You might organize foods on the kind of meal, such as all of the breakfast items, all of the lunch items, all of the dinner items, all of the snacks and all of the miscellaneous pantry items. Whatever system works best for you, find that system and put into place. Then, find time each month to organize and purge the pantry to avoid wasting food and to maintain organization and neatness. Modern Kitchen Organization Tip #3: Let Lazy Susan Do the Work. Lazy Susans are spinning trays or turntables that not only allow you to use up all of your cabinet and counter space by utilizing precious vertical space that is often times under-utilized and wasted, but it also lets you maximize spaces that you might not otherwise use because it’s too difficult to reach or access—such as the corner space in a cabinet. Modern Kitchen Organization Tip #4: Curb Your Container Enthusiasm. There’s an obsession around collecting plastic containers, whether it’s plastic containers that foods are packaged in or a collection of plastic containers you can get at the grocery store for storing and easily transporting foods. What often happens is it leaves kitchen drawers cluttered with a vast array of plastic containers and mismatched lids. Consider investing in a set of higher quality containers that you can also use as serving dishes and that you can easily organize and store by size and shape. Limit yourself to a dedicated drawer for containers and when you start to notice you’re filling up, recycle old containers and take the time to organize the container drawer. Modern Kitchen Organization Tip #5: Routinely Clean the Refrigerator. The refrigerator is probably one of the dirtiest areas of your kitchen. The refrigerator is not safe from mold, mildew, food spills, and spoiled food. Make sure that you routinely clean your refrigerator, which not only includes going through its contents to make sure to check the expiration dates of food and the quality of produce, but also to wipe down any spills with an antibacterial wipe, which will help kill bacteria and keep you and your family safe from getting ill due to unintended contamination. Modern Kitchen Organization Tip #6: Use Islands to Your Advantage. Last, but not least, space permitting, use an island to take advantage of space that might not otherwise be used for storage and organization. Kitchen islands can add a significant amount of under-counter storage as well as overhead storage. These are just a few organization ideas for your modern Italian kitchen. There are thousands—if not millions—of other organization options. The next time you’re looking to remodel or upgrade your kitchen, contact EuroAmerica Design, the leading experts in modern kitchen remodeling. Looking to remodel your kitchen, but aren’t quite sure where to start with your remodeling budget? No problem. According to this article on HGTV.com, here are some tips for planning out your kitchen remodeling budget. Tip #1. Determine How Much You Want to Spend…and Stick to It! Setting a budget for your kitchen remodel is one thing, but sticking to your budget is much harder than you may think. When planning how much you want to spend on your kitchen remodel, there are three factors to consider: 1) how much you can afford to spend, 2) how long do you plan to stay in your house, and 3) what kind of neighborhood you are located in. If you intend to sell your home within five years, your kitchen renovation should be considered a real estate improvement and your budget should be based on what you think you would be able to make back on it. If you plan on living in your home longer than five years, you should budget a kitchen remodel that will make you and your family the most comfortable and fit your family’s needs. Tip #2. Know How the Costs Break Down. On average, you can expect the labor costs for remodeling can consume anywhere from 20 to 35% of your total budget. Understanding how much the other costs will make up the total project will help when setting out your budget. Here is the average break down for the rest of a kitchen remodel: Cabinets – 35%; Appliances – 20%; Windows – 10%; Fixtures – 5%; Fittings – 3%; Other – 7%. Tip #3. Expect the Unexpected. With any remodeling project, you are going to encounter several unexpected costs and repairs. There can be all kind of surprise lurking behind the walls and under the floor. From wiring problems, busted plumbing, mold, termites and all kinds of repairs or work that you did not expect, you should have a 20% buffer in your budget to account for the unexpected. This is especially important if you’re in an older home where the chances of running into these kinds of unexpected, but necessary, repairs are much higher. Tip #4. Prioritize Your Remodeling Project. There are a lot of steps involved in a kitchen remodel. Decide what is most important to you so that if you have any unexpected costs that hit your budget, you can determine which things are most important to you so you can adjust accordingly based on this priority list. Also, if your budget buffer (as suggested in Tip #3) allows for some extras, you can figure out where you might be able to bump up your budget on the things that mean the most to you, whether it’s cabinets, lighting fixtures, appliances, or whatever fancy luxuries that you may be wanting to add. Tip #5. Factor in the Cost of Eating Out. While your kitchen is being remodeled, you will need to find somewhere else to eat, which means another cost to factor in is the cost of eating out. You also may decide that it is a better idea for you and your family to stay somewhere else while your kitchen is being remodeled. That is fine, but similarly, you will need to factor in the cost of lodging, storage fees, moving costs, etc. Tip #6. Monitor Your Budget. It is important to monitor your budget and regularly check in on your budget to make sure that you’re sticking with your plan. Put your estimated budget and your actual costs on a spreadsheet so that you can recognize when you need to make adjustments when necessary. Tip #7. Avoid Unplanned Extras Mid-Project. You may be tempted to stray from your budget mid-project and you might even catch yourself saying, “Wouldn’t it be great if we added (insert fabulous kitchen feature) here…” Beware of this, because this is how budgets get blown! Go back to your remodeling budget and, if necessary, adjust your priorities. It’s okay to want some extras, but as with most things in life, you might need to make some adjustments or choose to live without. As you gear up for the fall season, you might be considering a new kitchen remodel to prepare for the festivities that the holiday season brings. Here are some popular contemporary kitchen ideas for the fall. The Media-Ready KitchenIt’s 2013 and what is more fitting than a kitchen space for entertaining guests and family. As much as we can encourage loved ones to turn off those electronics and enjoy some quality family time in the kitchen, sometimes you simply cannot change your family’s traditions and culture. Don’t worry. It doesn’t mean that you’re stuck with the under-cabinet television in a dingy kitchen though or TV trays in the living room. Here are a couple of contemporary kitchen designs with the media-loving family in mind! The Ambient Kitchen Kitchen lighting can make a huge difference for how the room looks and feel. It can make small rooms seem small and it can turn the kitchen from functionality to relaxation and romance with the flip of a switch—literally. Here is one modern kitchen design that carefully combines task lighting with ambient lighting. The Bold Kitchen Space with Dining Room This kitchen design tied in the bold color of an adjacent dining area in with the kitchen, with a nice contract of dark and bold color. The Dine-In Experience Not all homes are equipped with a separate room specifically for dining. This doesn’t have to mean that your family has to get stuck eating off TV trays, eating meals in separate rooms or squished on a small breakfast nook-like table in the kitchen. Here are some neat designs for the contemporary kitchen that brings the dining room into the design as well. These are just a few contemporary kitchen ideas for this fall. You can see how your next kitchen design can be personal to your family’s lifestyle and tastes (no pun intended). The designers at Berloni America can work with you to help you design your next kitchen with your personality and your family’s lifestyle in mind, along with some of these fall modern kitchen design ideas! This post is brought to you by the good folks at Berloni America—leaders in modern Italian kitchen remodeling. The designers at Berloni America can help you design your next kitchen with a combination of its high quality materials, chic designs and your personal touch. Contact us today for more information on how we can assist you with your next kitchen remodel. We would love to connect with you on Facebook. The lighting in any room can make a big difference in the overall look, feel, and design of the room. This holds true even more for the kitchen, which typically—anything from the floors, counter tops, appliances, and cabinets—has a number of reflective surfaces for light to bounce off and create an entirely unique look. Here are some lighting tips for your next contemporary kitchen. Kitchen Lighting Tip #1: The Perfect Blend There are four layers of lighting that has been noted to be the most effective for the kitchen. This includes task lighting, ambient lighting, accent lighting and decorative lighting. Combining and blending these four layers of lighting results in a warm and inviting room that not only makes it practical to work and cook in, but also a place to host events and entertain guests. The most common mistake that in the kitchen is lighting their entire kitchen with a single light fixture centered in the ceiling. It is too overpowering and typically does not allow enough light once fixtures, decorations and appliances are put into place. Kitchen Lighting Tip #2: Focus on Location, Location, Location! When it comes to lighting, location is everything—especially when you’re looking to blend the four types of lighting into one room. Task lighting is typically used for an area designated for food preparation. So, typically, task lighting would make the most sense underneath overhead cabinets and over an island, as well as underneath a stove hood. Another location for task lighting is inside the pantry. This focused lighting will make working and finding things you need easier. Kitchen Lighting Tip #3: Don’t Overlook Ambient Lighting Ambient lighting is an important layer for the kitchen that is typically overlooked. Ambient lighting is indirect lighting that is known for softening lines and shadows on people’s faces and creates a warm and inviting glow in the room. With the kitchen now becoming the go-to room for entertaining, this is a key layer of lighting you won’t want to miss. Ambient lighting fixtures typically include flush-mounted ceiling fixtures, pendant lights hanging over the island or even adjustable track lighting. Kitchen Lighting Tip #4: Add Accents Accent lightning is the least common layer used in the kitchen, but it is becoming more common since the kitchen has become the more popular room for entertaining. Types of accent lighting include track lighting, up-lighters, directional lights that draw attention to a fixture or piece of artwork, wall scones and much more. You can use hang your favorite piece of art along the wall or behind a table and use accent lighting to draw attention to these pieces. Accent lighting is also used in combination with tile backsplashes and in glass cabinets to illuminate vases, china and other glassware. Kitchen Lighting Tip #5: Decorative Lighting to Add Zing to Your Kitchen! Decorative light are things like chandeliers, hanging pendants and other eye-catching type of light fixtures that are more for decoration than anything else. However, be careful. Decorative lighting should be used in proportion to the size of your kitchen. If you have a small kitchen space, a chandelier may not be practical or advised, so be sure that you scale the fixtures to fit the kitchen space that you’re working with. Kitchen Lighting Tip #6: Use Technology to Make the Layers Work Together The best way to layer these four lighting designs is to have the flexibility to vary the amount of light of each item based on the task and function going on in the kitchen. You don’t want one simple flip of the light switch to turn on all of these lights all at once at their brightest levels, so invest in different dimmers and switches for each kind of light to ensure the best coordination between the levels. There are even systems that you can set a variety of scenes, pre-set lighting levels for different functions such as “Breakfast”, “Daytime”, “Food Prep”, “Dinner” and “Evening Hosting”. So, as you can see, choosing the lighting for your kitchen may not be quite as simple as picking out that ceiling fan or centered light fixture to light up the entire kitchen. If you’re going to take the time and expense to upgrade and remodel your kitchen, don’t cut out the time and expense involved to properly light your new kitchen. Proper lighting of your kitchen can make a big difference at the end of the day. There’s a reason why the kitchen has become a focal point and the center of much attention for most homes—it’s where the activity happens. For many busy families, it’s where they meet in the morning, it’s where they meet after work and school and it’s where guests are entertained on the weekends. Given this very fact, this is one of the reasons why the kitchen has to be designed with a great deal of thought and deliberation when designing or remodeling the kitchen area. However, as with most things in life, there are a number of “do’s” and “don’ts” when it comes to kitchen design. Thanks to the kitchen designing experts, Berloni America, here are the top six kitchen designing mistakes that people make when remodeling and designing their new kitchen space. Design Mistake #1: Boring, boring, boring. If the kitchen is the center of attention in the house, then find a way to attract people to it other than just the food. There are so many design trends to integrate into your kitchen design that there is simply no excuse to be boring in your design. From back splashes, kitchen islands, cabinets, sinks, appliances, lighting—there’s simply too many elements and designing opportunities to take advantage of! Design Mistake #2: Forgetting about seating. Even if you have a dining area in your home, forgetting about seating in your kitchen area is a big mistake. In most kitchen these days, there is a lot of entertaining, chatting and socializing that takes place in the kitchen itself. It’s no longer just the place to prepare the food. Between bar seating, kitchen islands and even small breakfast nooks, don’t forget about seating to entertain in your new kitchen. Design Mistake #3: Don’t waste valuable storage space. Storage space is a must in any kitchen. From storing dishes, cookware, spices, utensils, pantry foods, small appliances and other items for the kitchen, utilize as much space as possible (floor to ceiling, under the sink, kitchen islands, etc.) for storage. Design Mistake #4: Poor lighting. Lighting is really important in the kitchen, particularly since it’s now a huge part of entertaining guests. Whenever possible, natural light is always a plus. However, having right functional lighting for kitchen tasks balanced out with ambient light for creating an environment that welcomes people in to come in and socialize is a must. Design Mistake #5: Wrong kitchen island. Finding the right kitchen island for you is important. Whether you need a kitchen island for a second sink, additional seating, overhead storage, added counter space, a place for the kids to do homework while supervised, etc. Whatever the need may be for your home, make sure that you find the right kitchen island to fit your family’s needs. Design Mistake #6: Not hiring professionals. Last, but certainly not least, one major mistake made in kitchen design is not hiring professionals to help you—both in design and in the remodeling of your kitchen. The kitchen involves a number of integrated pieces of hardware, including plumbing, electronics and appliances. It is important that these items are installed correctly and properly so that you don’t have to deal with the headaches (and costs) involved in the do-it-yourself disasters that ensue on construction projects gone bad. Professional designers can also help you identify various designs that fit your needs and personal style. The next time you are considering remodeling or upgrading your kitchen, consider contacting the professional designers at Berloni America - - the leaders in modern kitchen design. This post is brought to you by the good folks at Berloni America—leaders in modern Italian kitchen remodeling. Contact us today for more information on how we can assist you with your next kitchen remodel. We would love to connect with you on Facebook.